I am a cat owner, which means that I occasionally have to deal with inexplicable “evil” deeds of my cat that sometimes make me think that my cat is possessed. 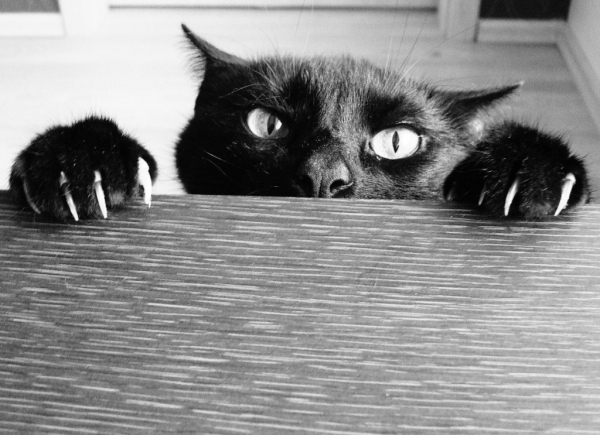 Of course, that is all just a result of playful spirit that cats have, mixed with their predatory nature and ability to sneak up on you without making a sound. I mean really, he often appears out of nowhere! However, in addition to their kind-of-evil behavior, some cats look like demons if they are caught in the right moment and cats on our list have all been photographed at the purrfect time. In the daytime, this might look like a photo of the cutest little furry gang. However, during the night, this gang looks downright scary and I for one wouldn’t mess with them. 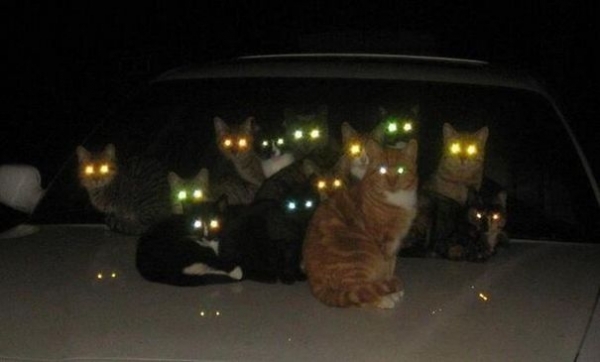 Just imagine having to fight dozens of cats. You lose for sure! 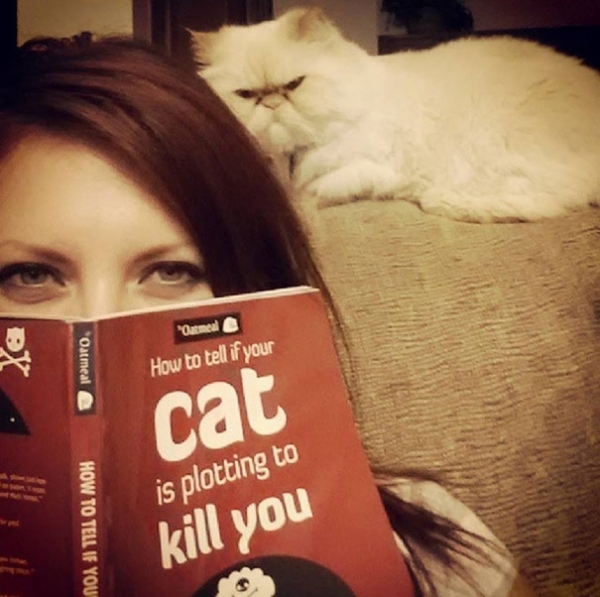 This looks like my cat, really. I can’t remember how many times I almost got a heart attack when he came at me like this, sneaky little bugger. I mean, check out those claws. He is ready to attack. And that left eye! It looks like the eye of Sauron! Now it’s nice and warm! This is the perfect example of a photo taken at the right moment. 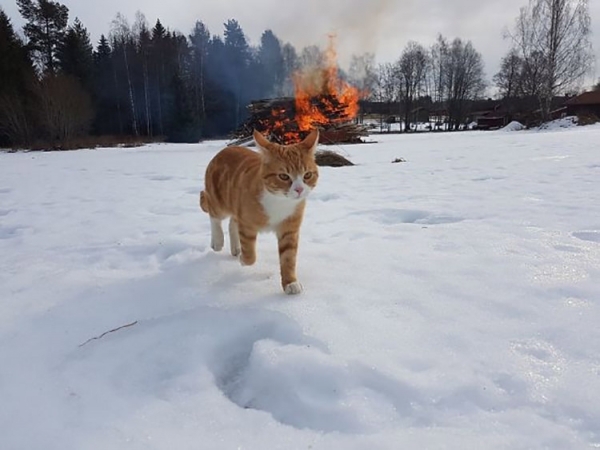 This cat is now the primary suspect in this arson case and I think that it is going to be convicted. Walking away from the crime scene like this, it should be a slam dunk. The only way to avoid being found guilty is bribing or threatening the jury, which would not surprise me at all. Now, this can’t be a cat. What kind of cat walks like this. This is obviously a demon, or at least a cat possessed by some spirits. And those glowing eyes, c’mon. You better call an exorcist! You think a book can help you? I don’t think this girl really needs a book to get the answer to her question. Her suspicions are justified, it is pretty obvious. Just look at that grumpy face on this evil ball of fur. He knows he will have to change his plan since the girl is onto him now.